Here’s the deal: The state, meaning the Michigan Secretary of State, revokes the license of anyone who picks up 2 DUI’s within 7 years, or 3 DUI’s within 10 years. If you get 2 within 7, your license is revoked for at least 1 year, whereas picking up 3 within 10 years will result in a revocation for at least 5 years. These revocations are for the rest of your life, and cannot be appealed in any way for the minimum of (hence the meaning of “at least) of either 1 or 5 years. A formal driver’s license restoration or clearance appeal requires filing a substance abuse evaluation and letters of support with the Secretary of State’s Driver Assessment and Appeal Division (DAAD) and then attending a hearing where you have to prove to a DAAD hearing officer that you are a safe bet to never drink again. If you take a few moments to think about this, it makes perfect sense. The state automatically concludes that anyone who racks up 2 DUI’s within 7 years, or 3 within 10 years, has a drinking problem that makes them too risky to be allowed to drive. That’s part of the whole “habitual offender” designation, and it’s not really that far-fetched. Lots of people, of course, will try to explain why none of this should apply to them, but the bottom line is that there is a line, and it starts at 2 DUI’s in a 7-year period. Michigan’s habitual offender laws are designed to take the licenses of repeat DUI offenders and not allow them to drive again until they fix their drinking problem. The state is keenly aware that less than 10% of all people with a drinking problem actually get and stay sober over the long term. Accordingly, “fixing” a drinking problem means quitting drinking forever, and being able to prove you’ve done it. A few years back, Ann, my senior assistant, observed that while truly sober people really understand the concept of sobriety, most other people don’t. Accordingly, I will try to make the distinction as clear as I can: If you have had your license revoked, and you still drink at all, ever, then you’re not “sober” in the sense that you can win a license appeal. Moreover, I am not interested in trying to tutor someone through the license restoration process by telling him or her what to say, or what not to say. Sure, I can imagine that I’ve had a client every now and then who has had a “slip” in his or her recovery that may have gone unmentioned, but the very notion of “slip” implies the person has been working at sobriety in the first place. This manifests itself when some “know it all” calls my office and figures that if he just plunks down the money, I’ll take his case and win his license back – guaranteed. This is a special and easily identifiable kind of blowhard who will usually say that he has done AA before, and remembers enough (or, worse yet, will go back for a refresher) to be able to put on a convincing show for the hearing officer: “I can say I quit drinking, if that’s what it takes…” I’m not interested. My integrity is not for sale, and you’ll never get to first base with that kind of a plan, anyway. 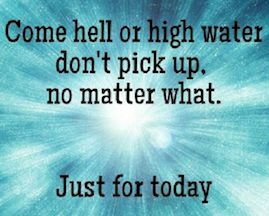 In the recovery world, everyone knows about “hitting bottom.” Without fail, before a person really gets clean or sober, there has to be a “bottom” moment. People will variously call this their epiphany, or light-bulb moment, or otherwise describe it as being like a light switch flipping. However it is explained, there comes a point, for those who get sober, where they’ve just had enough, are tired (or, as the AA people say, are “sick and tired of being sick and tired), and realize that drinking just is not fun anymore. It’s at this point they just say something like, “f–k this,” and surrender to the idea that the drinking has to stop for good. They suddenly realize that all of their past promises and plans and attempts to control, limit or moderate their drinking have failed. There is nothing left to do except to keep on the path of destruction, or to give up the ghost and quit drinking. Then, with a last gasp, in what is both an act of desperation and a leap of faith, they do quit, for real. At that moment, some people reach out to God, or a higher power. Some reach out to others. Contrary to conventional wisdom, some just know from the inside out that they must to quit for good, and they summon the strength to do just that. Whatever else, the decision to really stop drinking is qualitatively different from any other decision they’ve made in the past, especially any previous attempts to control their drinking. If you’ve lived through this, then you know what it’s all about. If this doesn’t resonate with or make any sense to you, then you’re probably not quite there yet. In life terms, it you might be there tomorrow, or it might take you a year, or even 10 years to get there. It happens when it happens. In terms of getting your license back, however, the final and viscerally “real” decision to quit drinking must have already happened, and you have to have lived through the experience. If you haven’t had this experience, then you can no more describe it than a man can describe what it’s like to give birth. For every rule, of course, there are exceptions. While I tend to hold fast to my belief that a decision to really quit drinking is accompanied by a “hitting bottom” experience, I have met a few people who just seem to have matured out of it. I’d honestly say that about 99% of the people I meet who have gotten sober could describe the decision to quit drinking as having been motivated, in whole or part, by something big. When a person has had enough, something significant has usually happened. A final DUI arrest is a frequent cause of a decision to get sober. Few of the people I have met come to the crossroads of drinking and sobriety after doing some calculations in their heads and think, “in the long run, I’d be better off if I no longer drank.” In the real world, the events surrounding this kind of decision are usually complicated and messy and not very pretty. Beyond the decision to stop, there has to be a reason to stay stopped. This is another absolute hallmark of real sobriety. People “quit” drinking all the time. Staying “quit,” however, is another thing altogether. The threat of getting locked up for drinking while you’re on probation is enough to keep some (but certainly not all) people from picking up again. In the real world, most people try and quit for good at least several times before it finally sticks. When a person quits drinking because he or she is forced to, or in an effort to keep someone else happy – in other words, when a person “quits” for any reason other than having hit his or her own bottom – it won’t last. If a person is threatened with the direst of consequences if he or she drinks again, sooner or later, those consequences will seem remote or unlikely enough to not act as a strong enough disincentive, and the person will drink. The only way to stay “quit” is when life is genuinely better for having made the decision. This really is the line of demarcation between simple abstinence and real sobriety. When a person wants to drink, but can’t, and that person doesn’t drink simply out of fear for the consequences, such abstinence is entirely and qualitatively different than when he or she has quit, and then builds and begins to enjoy a sober lifestyle. Real sobriety brings positive life changes. For some, those changes begin sooner than for others, but they inevitably begin and continue with each sober day. Every single person who gets sober reports feeling better, enjoying improved relationships with family and friends (as well as cutting ties with the drinking crowd), finding motivation to do better in life (this is often accompanied by completing or undertaking an education, getting a better job, or enjoying recognition and promotions at an existing job) as well as just finding a sense of “joy” in life. If you’ve experienced this, then it goes without saying that I’ve revealed nothing new here. I suppose that anyone who began this article and who hasn’t experienced this probably impatiently clicked off a long time ago. Ironically, it is really those folks I’m trying to reach. These are the people who come to my site, or to this blog, take a look at the quantity of information I’ve published, and then call me, figuring “he’s the guy.” If they see the word “guarantee,” they think the only thing standing between them and a driver’s license is money. The point I’m trying to make here is that if you haven’t really quit drinking, the same thing is standing between you and a driver’s license now that has been keeping you apart all along; alcohol. If you’re genuinely sober, I will win your driver’s license restoration or clearance case, and I guarantee it. If you still drink, then consider this yet another reason to quit, and just keep trying. As much as I guarantee to win your license back if you’re really sober, I also can guarantee that no one, on his or her deathbed, regrets not having drank more.